(CBS News) Hungry students are protesting the new lunches being served at schools around the country as part of the government's campaign to curb calories and fat at school. One group of teachers and high school students at Wallace County High School in Sharon Springs, Kansas, have created a music video called "We Are Hungry" to voice their displeasure. The tune parodies the song "We Are Young" by Fun. Students are seen in the video collapsing from hunger or smuggling snacks to feel full. The Healthy Hunger-Free Kids Act of 2010 was signed by President Barack Obama to add $4.5 million in new funding for federal school meals and child nutrition programs with the hope of increasing children's access to healthy food options over the next 10 years. According to the plan, improving nutrition means cutting down on calories. For kindergarten through 5th grade, students are allowed 650 calories per meal. In 6th through 8th grade, the number increases to 700 calories. High schoolers get 850 calories per meal. In addition, the U.S. Department of Agriculture will have the authority to set all nutritional standards and more money will be provided to schools that comply. In January, USDA Secretary Tom Vilsack was joined by First Lady Michelle Obama to announce the new-look lunches that would be hitting school cafeterias by August 2012. CBS This Morning reported that while school lunches may be less caloric, students are allowed to get additional helpings of fruits and vegetables, and they are allowed to purchase extra a la carte items. But, not everyone is happy with the new plan. Craig Idacavage, the principal at St. Marks near Wichita, Kansas, understands why students are angry at the smaller meals. His students led a protest where they encouraged their peers to "brown-bag" their lunches instead of buying them at the cafeteria. Idacavage pointed out to KAKE that some active kids get to school at 8:30 a.m. and won't leave until 5:30 p.m., and lunch will be the only meal they eat. 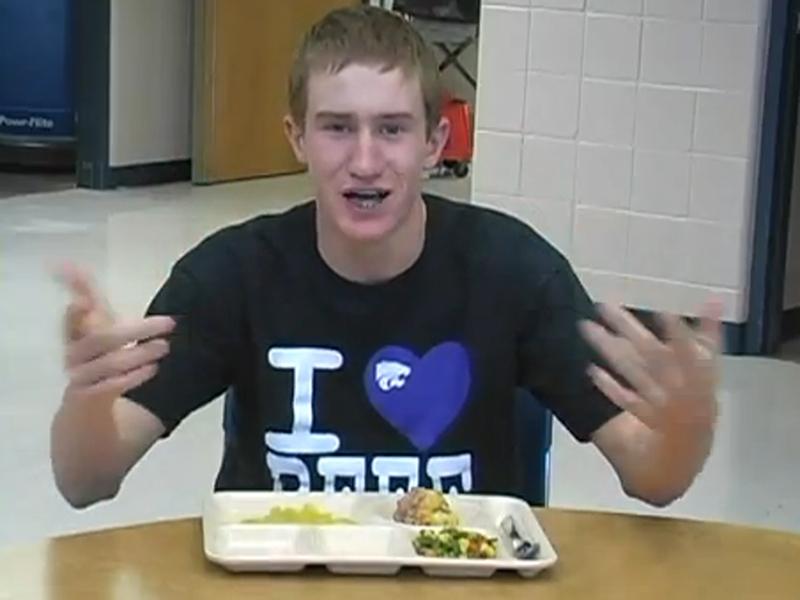 "This year, we'll be hungry by 2:00," 7th grader Zach Eck told KAKE. "We would eat our pencils at school if they had nutritional value." Other protests around the country included another brown bag campaign in Pennsylvania and a boycott of school lunches in Wisconsin. A Facebook page, Nutrition Nannies, has sprung up in order to support the No Hungry Kids Act, a bill that is meant to respond to what they deem as harsh cuts on calories. The bill was created by Congressman Steve King (R-IA) and co-sponsored by Congressman Tim Huelskamp (R-KS). And at Greater New Bedford Vocational-Technical High School in New Bedford, Mass., students have been caught sneaking in chocolate syrup in order to flavor their milk. South Coast Today reports that a squeeze of the syrup bottle is going for as much as 50 cents. Lise Gloede, a dietitian, told CTM that while the plan is a good idea, the smaller amount of calories can leave some like student-athletes hungry. "I don't think this can be a one-size-fits-all," she said.